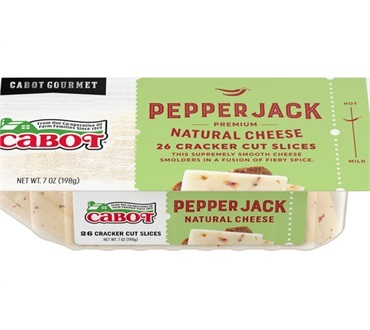 The addictive kick of Cabot Pepper Jack makes it a perennial fan favorite. The added kick of our Lactose-Free Pepper Jack is a perfect match for crisp, buttery crackers --which is why we're pleased to offer our Pepper Jack Cracker Cuts. Packaged ready-to-serve in a convenient tray and pre-sliced to perfect cracker-sized bites, our Pepper Jack Cracker Cuts are ready to layer with deli meat or a dollop of mustard atop your favorite wheat or white cracker. Great for parties or packing for lunch. Medium heat...for those who like a little spice in their life. Cabot lactose free cheeses are great! I am lactose intolerant and enjoy Cabot cheeses because they are lactose free. I do enjoy the pepper jack cheese but I would like to have a milder cheese without the pepper Any chance of helping out us lactose intolerant people? Normally, do not buy Pepper Jack from anywhere. But, as I gave a Dakim gift package that contained this, thought I should give it a try. Delicious. Natural tasting. Nothing artificial or processed tasting - something that usually bothers me about other pepper jacks. Only thing that I might have a slight issue with is that it was not sent cold-packaged - so the texture was a little slick. Despite this, still delicious. Wish I could find this and Cabot spreads in the grocery stores as well.